The Nasdaq Stock Market (/ˈnæzˌdæk/ ( listen), also known as Nasdaq) is an American stock exchange. It is the second-largest stock exchange in the world by market capitalization, behind only the New York Stock Exchange located in the same city. The exchange platform is owned by Nasdaq, Inc., which also owns the Nasdaq Nordic (formerly known as OMX) and Nasdaq Baltic stock market network and several U.S. stock and options exchanges. "Nasdaq" was initially an acronym for the National Association of Securities Dealers Automated Quotations. It was founded in 1971 by the National Association of Securities Dealers (NASD), which divested itself of Nasdaq in a series of sales in 2000 and 2001. The Nasdaq Stock Market is owned and operated by Nasdaq, Inc., the stock of which was listed on its own securities exchange on July 2, 2002, under the ticker symbol NDAQ. The Nasdaq Stock Market began trading on February 8, 1971. It was the world's first electronic stock market. At first, it was merely a "quotation system" and did not provide a way to perform electronic trades. [not in citation given] The Nasdaq Stock Market helped lower the spread (the difference between the bid price and the ask price of the stock) but was unpopular among brokerages which made much of their money on the spread. The NASDAQ Stock Market eventually assumed the majority of major trades that had been executed by the over-the-counter (OTC) system of trading, but there are still many securities traded in this fashion. As late as 1987, the Nasdaq exchange was still commonly referred to as "OTC" in media reports and also in the monthly Stock Guides (stock guides and procedures) issued by Standard & Poor's Corporation. Over the years, the Nasdaq Stock Market became more of a stock market by adding trade and volume reporting and automated trading systems. It was also the first stock market in the United States to trade online, highlighting Nasdaq-traded companies and closing with the declaration that the Nasdaq Stock Market is "the stock market for the next hundred years". The Nasdaq Stock Market attracted new growth companies, including Microsoft, Apple, Cisco, Oracle and Dell, and it helped modernize the IPO. Its main index is the NASDAQ Composite, which has been published since its inception. However, its exchange-traded fund tracks the large-cap NASDAQ-100 index, which was introduced in 1985 alongside the NASDAQ Financial-100 Index, which tracks the largest 100 companies in terms of market capitalization. In 1992, the Nasdaq Stock Market joined with the London Stock Exchange to form the first intercontinental linkage of securities markets. The National Association of Securities Dealers spun off the Nasdaq Stock Market in 2000 to form a publicly traded company. In 2006, the status of the Nasdaq Stock Market was changed from a stock market to a licensed national securities exchange. In 2010, Nasdaq merged with OMX, a leading exchange operator in the Nordic countries, expanded its global footprint, and changed its name to the NASDAQ OMX Group. To qualify for listing on the exchange, a company must be registered with the United States Securities and Exchange Commission (SEC), must have at least three market makers (financial firms that act as brokers or dealers for specific securities) and must meet minimum requirements for assets, capital, public shares, and shareholders. In February 2000, in the wake of an announced merger of NYSE Euronext with Deutsche Börse, speculation developed that NASDAQ OMX and Intercontinental Exchange (ICE) could mount a counter-bid of their own for NYSE. NASDAQ OMX could be[when?] looking to acquire the American exchange's cash equities business, ICE the derivatives business. At the time, "NYSE Euronext's market value was $9.75 billion. Nasdaq was valued at $5.78 billion, while ICE was valued at $9.45 billion." Late in the month, Nasdaq was reported to be considering asking either ICE or the Chicago Mercantile Exchange to join in what would probably have to be, if it proceeded, an $11–12 billion counterbid. In 2005, NASDAQ acquirred Instinet for $1.9 billion retaining the INET ECN and subsequently sellin the agency brokerage business to Silver Lake Partners and Instinet management. The European Association of Securities Dealers Automatic Quotation System (EASDAQ) was founded as a European equivalent to the Nasdaq Stock Market. It was purchased by NASDAQ in 2001 and became NASDAQ Europe. Operations were shut down, however, as a result of the burst of the dot-com bubble. In 2007, NASDAQ Europe was revived as Equiduct, and is currently[when?] operating under Börse Berlin. On June 18, 2012, Nasdaq OMX became a founding member of the United Nations Sustainable Stock Exchanges Initiative on the eve of the United Nations Conference on Sustainable Development (Rio+20). In November 2016, Nasdaq chief operating officer Adena Friedman was promoted to the role of CEO, becoming the first woman to run a major exchange in the U.S. In 2016, Nasdaq earned $272 million in listings-related revenues. In October 2018, the SEC ruled that the NYSE and Nasdaq did not justify the continued price increases when selling market data. Level 1 shows the highest bid and lowest ask—inside quote. Level 2 shows all public quotes of market makers together with information of market dealers wishing to buy or sell stock and recently executed orders. Level 3 is used by the market makers and allows them to enter their quotes and execute orders. The Nasdaq Stock Market averages about 253 trading days per year. Capital Market (small cap) is an equity market for companies that have relatively small levels of market capitalization. Listing requirements for such "small cap" companies are less stringent than for other Nasdaq markets that list larger companies with significantly higher market capitalization. Global Market (mid cap) is made up of stocks that represent the Nasdaq Global Market. The Global Market consists of 1,450 stocks that meet Nasdaq's strict financial and liquidity requirements, and corporate governance standards. The Global Market is less exclusive than the Global Select Market. Global Select Market (NASDAQ-GS large cap) is a market capitalization-weighted index made up of US-based and international stocks that represent the Global Select Market Composite. The Global Select Market consists of 1,200 stocks that meet Nasdaq's strict financial and liquidity requirements and corporate governance standards. The Global Select Market is more exclusive than the Global Market. Every October, the Nasdaq Listing Qualifications Department reviews the Global Market Composite to determine if any of its stocks have become eligible for listing on the Global Select Market. As of June 2015, the Nasdaq Stock Market had an average annualized growth rate of 9.24% since its opening in February 1971. Since the end of the recession in June 2009 however, it has increased by 18.29% per year. Wikimedia Commons has media related to NASDAQ. ^ "Nasdaq Companies". Archived from the original on February 13, 2011. Retrieved December 1, 2018. ^ "Monthly Reports". World-Exchanges.org. World Federation of Exchanges. Archived from the original on August 17, 2014. Retrieved June 3, 2015. ^ "Nasdaq – Business Solutions & Services". 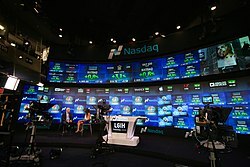 Business.nasdaq.com. Archived from the original on October 20, 2016. Retrieved October 23, 2016. ^ a b Terrell, Ellen. "History of the American and Nasdaq Stock Exchanges". LOC.gov. Library of Congress Business Reference Services. Archived from the original on April 14, 2013. Retrieved April 27, 2013. ^ "Nasdaq.com Frequently Asked Questions". Nasdaq.com. Retrieved October 23, 2016. ^ Gilpin, Kenneth N. (July 3, 1987). "Company News: An Erratic Quarter for Stock Markets". The New York Times. ISSN 0362-4331. Archived from the original on August 1, 2017. Retrieved February 1, 2017. ^ Odekon, Mehmet (March 17, 2015). Booms and Busts: An Encyclopedia of Economic History from the First Stock Market Crash of 1792 to the Current Global Economic Crisis: An Encyclopedia of Economic History from the First Stock Market Crash of 1792 to the Current Global Economic Crisis. Routledge. ISBN 9781317475750. Archived from the original on August 3, 2017. ^ "NASDAQ Composite daily index". Archived from the original on November 22, 2010. ^ Glassman, James K. (February 11, 2015). "3 Lessons for Investors From the Tech Bubble". Kiplinger's Personal Finance. Archived from the original on April 15, 2017. ^ Walsh, Michelle. "Nasdaq Stock Market Becomes A National Securities Exchange; Changes Market Designations". Archived from the original on December 17, 2013. ^ Lucchetti, Aaron; MacDonald, Alistair (May 26, 2007). "Nasdaq Lands OMX for $5.7 Billion; Are More Merger Deals on the Way?". Wall Street Journal. ISSN 0099-9660. Archived from the original on July 31, 2017. Retrieved July 21, 2007. ^ De la Merced, Michael J., "Nasdaq and ICE Hold Talks Over Potential N.Y.S.E. Bid" Archived January 20, 2012, at the Wayback Machine, The New York Times Dealbook, February 18, 2011, 12:46 pm. Retrieved February 18, 2011. ^ Fraser, Michelle E., "Nasdaq May Ask CME or ICE for Help in NYSE Counterbid, WSJ Says" Archived July 29, 2014, at the Wayback Machine, Bloomberg, February 26, 2011 9:30 am ET. Retrieved March 1, 2011. ^ "Nasdaq to Acquire Instinet in $1.9 Billion Deal". The New York Times. 2005-04-22. ISSN 0362-4331. Retrieved 2019-04-03. ^ "Easdaq Makes A Comeback As Equiduct". Archived from the original on February 13, 2011. ^ "Sustainable Stock Exchanges Initiative: Exchanges listing over 4,600 companies commit to promoting sustainability". Reuters.com. Reuters. Archived from the original on May 13, 2014. Retrieved May 13, 2014. ^ "Nasdaq's New CEO Attributes Her Success to an 'Eclectic' Career Path". Fortune. November 15, 2016. Archived from the original on November 17, 2016. Retrieved November 17, 2016. ^ Osipovich, Alexander (October 26, 2017). "Startup Exchange Cleared to Take on NYSE, Nasdaq for Stock Listings". Wall Street Journal. New York City, United States. Archived from the original on October 26, 2007. Retrieved October 26, 2017. ^ Alexander Osipovich; Dave Michaels; Gretchen Morgenson. "SEC Ruling Takes Aim at Stock-Exchange Profits". Wall Street Journal. Retrieved 18 October 2018. ^ "SEC rules NYSE and Nasdaq did not justify data fee increases". Financial Times. Retrieved 18 October 2018. ^ Michaels, Dave (2018-10-19). "NYSE, Nasdaq Take It on the Chin in Washington". Wall Street Journal. ISSN 0099-9660. Retrieved 2018-10-19. ^ "Order Book, Level 2 Market Data, and Depth of Market". Daytrading. About.com. Archived from the original on February 13, 2011. ^ "Nasdaq Level III Quote". Archived from the original on April 13, 2014. ^ "Nasdaq Trading Schedule". Nasdaq.com. Archived from the original on April 17, 2014. Retrieved April 20, 2014. ^ "Definition of 'Nasdaq SmallCap Market', now known as Nasdaq Capital Market". Investopedia.com. Archived from the original on August 4, 2013. Retrieved August 25, 2013. ^ "Definition of 'Nasdaq Global Market Composite'". Investopedia.com. Archived from the original on September 17, 2013. Retrieved August 25, 2013. ^ "Definition of 'Nasdaq Global Select Market Composite'". Investopedia.com. Archived from the original on October 4, 2013. Retrieved August 25, 2013. ^ "Measuring Worth – Measures of worth, inflation rates, saving calculator, relative value, worth of a dollar, worth of a pound, purchasing power, gold prices, GDP, history of wages, average wage". measuringworth.com. Archived from the original on October 4, 2015. Retrieved October 2, 2015.